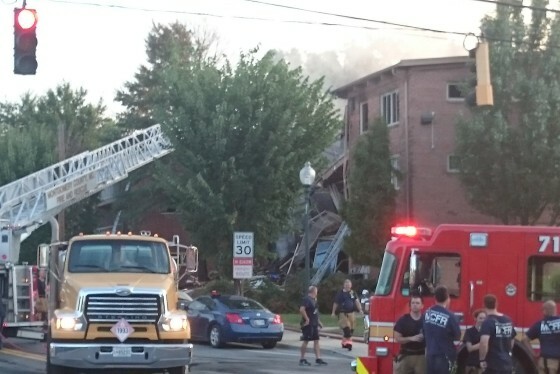 Natural gas was a factor in the deadly explosion at a Silver Spring apartment complex last week, sources close to the investigation tell WTOP. WASHINGTON — Natural gas was a factor in the deadly explosion and fire at a Silver Spring apartment complex last week, sources close to the investigation tell WTOP. At least seven people were killed in the explosion at the Flower Branch Apartments, on Piney Branch Road in Silver Spring Aug 10. More than 30 people were injured and more than 100 were displaced. Montgomery County officials are expected to release more details about the cause of the blast at a news conference at 11:30 a.m. Friday. The Bureau of Alcohol, Tobacco, Firearms and Explosives and the National Transportation Safety Board have also been investigating and will participate in the Friday news conference. On Wednesday, the NTSB announced it would open its own investigation into the explosion. The agency is analyzing pipelines carrying natural gas near the complex. Earlier this week, crews from Washington Gas tested gas lines near the scene of the explosion. Several residents of the building said they had reported smelling the odor of natural gas in the weeks before the explosion. The fire department was called to the complex several weeks before the explosion to respond to reports of a gas odor. Police have still not publicly identified the seven sets of remains pulled from the wreckage of the apartment complex, although they have released the names and photos of seven people who were missing after the blast and are presumed to be dead. Police this week asked family members to provide DNA samples in order to help identify the remains.